In early 2015, a photograph of a dress on Tumblr prompted an internet discussion that dominated the news cycles for over a week. Some people saw a white and gold dress in dark shadow while others saw a blue and black dress washed out in bright light. What everyone wanted to know was: what color was the dress? The answer was deceptively simple: It depends; one might see the light as blue or gold depending on their interpretation of the amount of light. Just like in photography, light and lighting design work as an invaluable, marketing tool in retail spaces. As discussed in a previous article on the importance of lighting design in retail stores, studies have found that lighting influences the way the average customer feels—and purchases. Contextually, when it comes to sales—good lighting helps. Relevant to highlight, that since the average customer is unaware of how they respond to lighting, a customer survey might not point to lighting as the cause of sale(or lack thereof). So, what exactly makes up good lighting in a retail store? At DLC, through our experience and various studies on lighting and retail, we put together a short list of eight lighting techniques that boost retail sales. 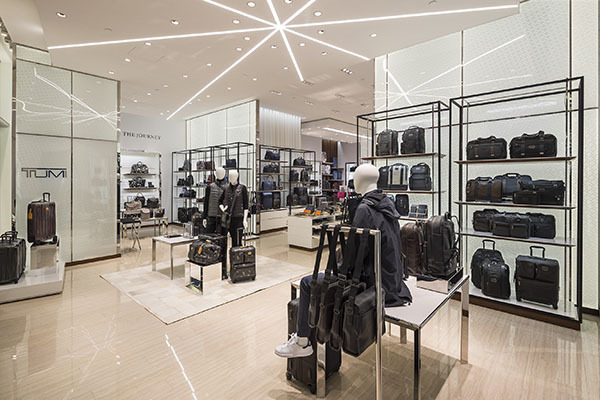 Across studies, contrast is, the most important facet of retail store lighting. Store customers reacted favorably to lighting design that included a combination of light and dark areas. In fact, in stores that used contrast lighting well, customers were not only able to see the products but also felt more comfortable. OOne of the ways to build a sense of contrast in a retail store, is to use a combination of ambient and accent lighting. This makes perception easier and focuses attention. There should be an moderate level of ambient light around the store with some dark areas. This should then be coupled with accent lighting on the important products and section which helps direct the customer attention to the areas you want. Hence, it is critical to design lighting systems to light walls and other vertical spaces to bring customers into the retail store. Pointing spotlights straight down on your product line can make the surrounding space feel dark. However, lighting walls with products like Lumisheet adds brightness to a room and creates a sense of spaciousness. Remember, while it is important to light vertically, sticking only to lighting straight down from the ceiling does little to persuade the customer. Often ignored, layered lighting is one of the most useful tools in interior design. Exactly like interior designers use the principles of texture, color and pattern when designing a space, lighting designers also use different forms of lighting in combination. Lighting designers divide light into three layers: ambient, task and accent. With these three layers carefully curated, you’ll have a balanced and comfortable retail space. Once you’ve got all your lighting in place, balancing the layers just depends on the scenario. Dimmable ambient lighting can be lowered for a jewellery company or brightened for a cosmetics shelf. Also, by using LED lighting fixtures, designers can now create a balanced lighting layout, while cutting the facility’s lighting energy cost. Accent lighting is lighting that targets or highlight a specific part of retail stores by drawing attention through contrasts in brightness. At least three times brighter than ambient lighting, accent lighting creates visual interest by drawing the eye to particular elements or spaces. It can be used to highlight specific retail products or to lead customers from one area to another through signals and contrasts. While accent lighting is an effective strategy for nearly any business, it is most useful for smaller, high-end boutiques. These retail stores have a small format and are also more likely to have products that they want to sell more than others. However, since they have very attentive staff to help customers look around and find products, general lighting is less important than accent lighting. First, let us think for a moment about the nature of light. If we take a brightly colored object in to a totally darkened room, the object loses all of its color. If this object, therefore, is so dependent upon light for its color, then color must be an important property of light. Colors have a deeply psychological impact on the shopping experience, influencing a wide range of consumer moods and emotions. 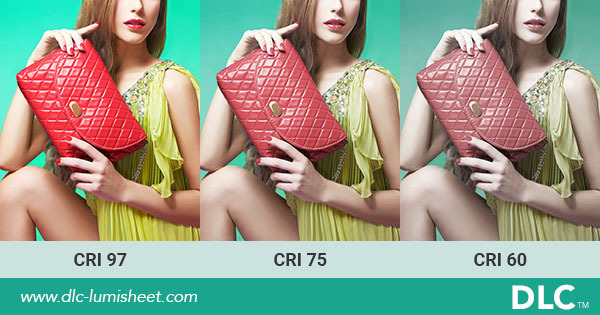 Besides the experience, colors have a significant influence on the final outcome-to buy or not to buy. For example, color temperature in fitting rooms is particularly important, as these areas are among the most critical evaluation zones. 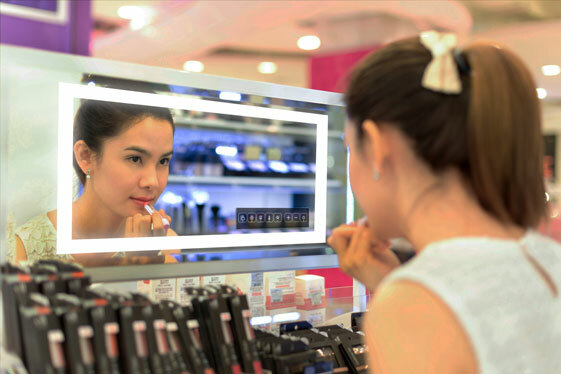 Hence, to persuade the shopper, fitting rooms can be fitted with controllable mirror lighting which showcases the product in the ideal light. Color display measures how well we can observe colors under a certain kind of light and is used in a color rendering index (or CRI), with a scale of 1 to 100 Ra where 100 Ra stands for perfect light, in this case real daylight. While sometimes considered a technical afterthought, and sometimes mistakenly confused with colour temperature, the correct color rendering is incredibly important to the retail industry because it’s vital that customers see products in the way they’re supposed to. When the most accurate color rendering is essential, such as in a retail format, 90+ CRI values are recommended. To meet these exacting requirements, DLC introduced Lumistick which is available in high CRI and is a great choice for shelving systems and edge lighting. Ideally, in retail(or any industry for that matter), a high CRI is a safe choice to go with since vast improvements can be achieved in the appearance of a product/layout/space, where lighting changes from lower CRI to higher. Another increasingly important trend is that of control systems, wireless and automation and it’s definitely the most exciting one for retail stores. 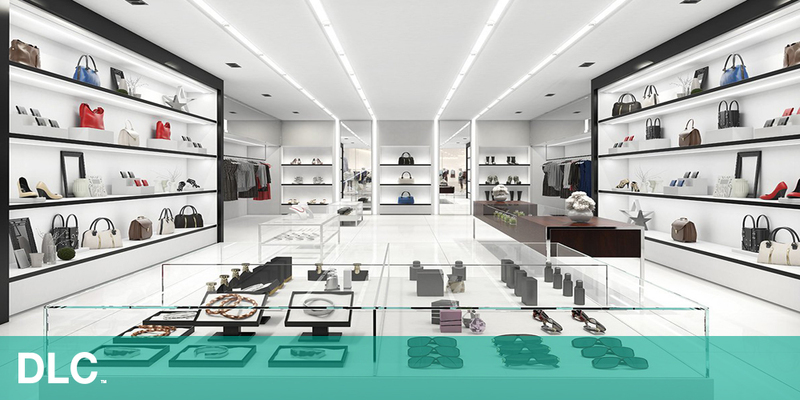 With advanced lighting control systems, stores are able to create different displays for different environments. Retailers can tailor the light through adjusting the light sources, colour rendering and colour temperature to create certain effects that make the customer feel comfortable and hence more inclined to buy. Imagine a changing room where you can choose between different light scenes depending on what type of clothes you are wearing. For instance, wearing a shirt for work demands one type of lighting, a dress for a night out another and a pair of shorts for a day on the beach a third. With DLC’s lighting control solutions such as Omni Control that offer very high energy efficiency, retailers can allow the customer to change the lighting scene using a touch panel. In general, backlit signs are a great way to increase visibility, deliver improved contrast from other visual media in a “noisy” space & have your message seen in vibrant detail, at all hours of the night or day. 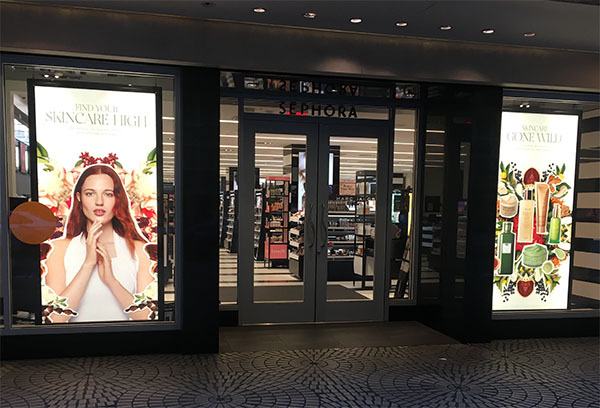 Lightboxes strategically distributed around a shopping space do an amazing job of conveying the important messages that retailers want store visitors to come away with. Professionally-produced backlit photos and graphics in lightboxes elevate brand message to “near-real life”, with more realistic/vivid subject lighting than non-backlit messaging. In this day and age, backlit LED lightboxes are a popular choice because they’re exceptionally bright, diffuse (spread) the light without hot spots and use very little energy. While generating repeat business is a function of whether or not the products being sold are of a certain quality, retailers need to score first-time business they can worry about subsequent sales. The wrong lighting scheme can send shoppers into a competitors’ stores without even considering a purchase, so it’s incredibly important that retailers know what they’re doing before they flip the switch. Or, simply choose a lighting company that does the research for you. With a lighting expert like DLC, you don’t just get LED lighting products; you also get lighting design strategy, with technical support before and after the installation. Reach out to DLC today to see what we can offer to improve the efficiency, reliability and control of your lighting systems.